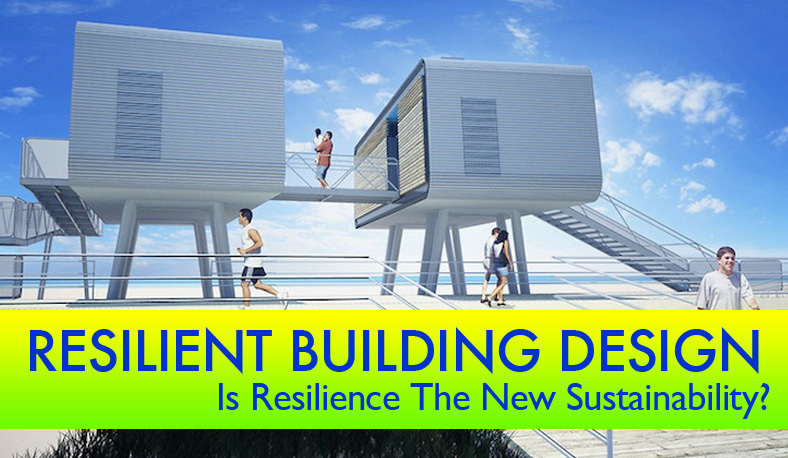 Resilient Design: Is Resilience the New Sustainability? Ever since Hurricane Sandy wrought havoc on the East Coast, ‘resilient design’ has been a hot topic of conversation — and not just amongst architects and designers, but politicians, engineers and city planners as well. In November 2012, ‘Resilient Design’ was a trending search term in Google, moving from near obscurity in the months before the devastating super storm to a popular catchphrase post-Sandy. Natural disasters like this, and more recently the typhoon that hit the Philippines in early November, serve to remind those of us in the green design community that while building with pure “save-the-earth” ecological motivation is certainly important, low-VOC-paints and LEED points don’t matter much if a building becomes uninhabitable due to flooding, earthquake, power outages or some other natural or manmade disaster. That’s where resilient design comes into play. According to the Resilient Design Institute, resilient design is defined as “the intentional design of buildings, landscapes, communities, and regions in response to vulnerabilities to disaster and disruption of normal life”. Major disasters like Typhoon Haiyan, Hurricanes Katrina and Sandy, and earthquakes in Japan, Pakistan and Haiti are a wake up call to remind designers that we always need to keep the long-term picture in mind when we design, preparing buildings to withstand possible disasters as well as more mundane long-term wear and tear. While the term “sustainability” in today’s lexicon often conjures up an image of CFLs, Priuses and low carbon emissions, “sustainability” literally means “to endure”. Any so-called “green” products and buildings that don’t stand the test of time are not truly sustainable. As climate change turns our attention to the possibility of increasingly likely disaster scenarios, resilient design serves to remind us to design for durability over time. So What Does ‘Resilient Design’ Entail When It Comes to Building? To design a building with resiliency means to start the design process by thinking carefully about the typical use scenarios of the building, common points of stress due to normal use, as well as the most likely disaster situations in the environment that could challenge the integrity of the building and/or endanger its occupants. The local environment always plays a critical role in determining the factors that make a building resilient or not, and so resilient design is always locally specific. For example, New York City has a wet climate, and water is a part of its environmental challenges throughout the year. In New York City, the most common and likely natural disaster scenarios involve water: hurricanes, flooding, storm surges, and blizzards. Resilient building in New York City needs to plan for all of these types of events, as well as the day-to-day stress that comes from significant precipitation year round, high-humidity, and the alternation of humidity (in the summer), with extremely dry interior air (in heated buildings in the winter). Of course, builders in New York City also need to design to withstand seismic activity, high heat loads in the summer, power outages, manmade disasters like terrorism, as well as the normal damage that comes with thousands of people moving through spaces in rapid succession. On the West Coast of the United States, seismic considerations are obviously much more of a concern, as well as fire danger. Thinking through every potential problem and possible disaster situation can be overwhelming for designers, which is why a sensible approach starts by examining the most likely problem situations and pulling from local wisdom, knowledge and experience. Most of the talk about ‘resilient design’ these days is generally in the context of residential buildings and community infrastructure (such as how New York City can engineer to protect itself against the next major storm surge from a disaster like Hurricane Sandy). What is unfortunate is that in all the discussion surrounding resilient residential buildings and city-wide infrastructure, non-residential buildings are too often overlooked. Examples like Hurricane Sandy show us that more resilient structures are hugely important when it comes to health, safety, and comfort within a city. For example, if the Con Edison power plant that exploded on 14th Street in lower Manhattan during Hurricane Sandy had had higher flood barrier walls — and had generally been better designed to withstand flooding — all of lower Manhattan would not have lost power for the 4 days that followed Hurricane Sandy, leading to widespread evacuations, hospital evacuations, and public transportation failure. Similarly NYU Langone Hospital and Bellevue Hospital in Manhattan’s East side would not have been so devastated, requiring the emergency evacuations of thousands of patients, had they also been better designed to withstand flood waters from a storm surge. So how can we build resiliency into commercial buildings? The first step is to consider all possible and likely disaster scenarios, as well as all sources of general everyday stress, and then start the design process with all of these considerations in mind. When it comes to devastating natural disasters, earthquakes are high up on the list, but what many people don’t realize is that much of the damage in earthquakes occurs largely due to poorly constructed buildings and faulty infrastructure. Fortunately, there are many new technologies and building methods that allow buildings to be increasingly ductile and able to withstand severe seismic activity. Contrary to what the layperson might think, a structure’s ability to flex and absorb vibration is just as important as how strong it is when it comes to earthquake-proof design. 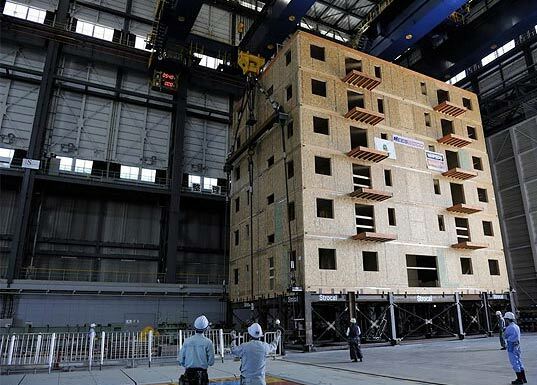 One of the most popular seismic building methods is base isolation, which is exactly what it sounds like — decoupling the base of a structure from the rest of the building so that only the base shakes during an earthquake while the superstructure remains intact. As with all seismic construction, expansion joints are deployed within, between, and around structures to allow the building to move without damage during seismic activity. Chances are you have never seen an expansion joint before, but hundreds of thousands of people walk over them everyday without realizing it due to expansion joint covers. Expansion joint covers are designed to provide a seamless look while concealing the gaps beneath the floor’s surface. These covers allow the day-to-day movement of a structure’s thermal expansion and contraction, but also allow much greater movement during seismic events. Expansion joint covers are designed to remain intact during a seismic event, to allow egress of the buildings’ occupants, and after a seismic event, to allow entry back into the building. Above all, good seismic design not only helps a building be resilient, but protects occupant life! Seismic testing can be used on components of buildings, model representations, and even entire buildings at actual scale to determine their resilience in withstanding earthquakes. 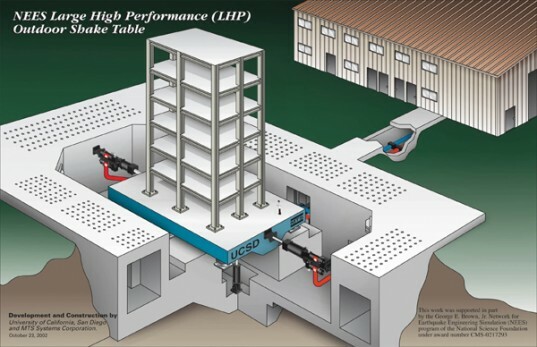 A common way to test the seismic resilience of a design is to use a “Shake Table”. This is a rectangular platform which is coupled to hydraulic motion actuators to shake the platform in different ways and therefore, test structural models or building components with a wide range of simulated ground motions, including reproductions of recorded earthquakes time-histories. As climate change brings rising sea levels and more extreme weather events, building designers need to focus extra attention on the challenges of weather – especially hurricanes and flooding. When designing commercial buildings in hurricane and flood prone areas, special attention needs to be paid to designing to resist severe wind load, as well as heavy precipitation, and ground-level flooding. Buildings in hurricane prone areas need to be very well-sealed, as well as have adequate drainage solutions for roofs, terraces, basements, and any other areas which may collect water. For mechanical rooms, where adequate ventilation and outside air-intake is important, storm-resistant louvers are a good choice for maximizing air intake while blocking wind and driving rain. They’re designed specifically to let air in and keep wind and driven-rain out. Flood barrier walls are obvious solutions to the threat of flooding on the ground level, as well as not locating emergency backup generators, or anything else important, in the basement. On this note, smart building designers would do well to locate all important mechanicals on the tops of buildings rather than in the basement, in flood-prone regions. As previously mentioned, if New York City’s east river hospitals were built more resiliently, with important mechanicals on top floors rather than basement, they would have fared far better during Hurricane Sandy and not had to close operations and evacuate. The Spaulding Rehabilitation Hospital in Boston, designed by Perkins + Will (and awarded LEED gold), is a great example of what to do when it comes to the location of important mechanical systems. As you can see from the above photo, the hospital’s mechanicals are housed in the top floor of the building, so in the event of flooding or storm surges, the hospital is much less likely to lose power and need to evacuate its patients. The same types of passive design strategies that can be employed in homes to make them super energy efficient and green, can also be used in commercial buildings to result in everyday energy savings as well as life-saving natural heating and cooling options in a disaster situation without access to electrical power (and therefore mechanical HVAC). For example, if electricity is knocked out due to a flood or earthquake, or even if there is just a common “blackout”, an all-glass office building can quickly become like an oven on a hot summer day, potentially risking the health and lives of occupants inside. 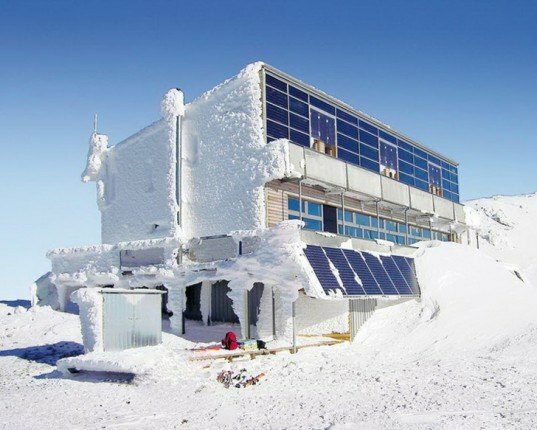 Proper insulation, natural ventilation with operable windows, solar shading devices, and employing stack ventilation can help buildings remain comfortable for inhabitants even when there is no mechanical heating and cooling available. Implementing solar shading devices is critical – not only for the unlikely event of a power outage or natural disaster, but also just to increase occupants comfort and to help to reduce the energy and cooling costs of a building during normal year round use. Fire is a danger as old as architecture itself — as long as humanity has had buildings, we’ve faced the threat of them catching fire. Most building code adequately addresses common fire hazards with mandatory fire-resistant stairwells, fire-resistant building materials and proper escape methods, but these days we also need to plan carefully to address fires caused by earthquakes, lightning and other natural disasters. In addition to urban fire hazards, wildfires are a growing threat in the Western United States, and steps that can be taken to protect commercial buildings against wildfire include fire-resistant landscaping, brush-clearing, and barrier zones in wildfire prone areas. New York building owners learned some resilient design lessons the hard way during Hurricane Sandy; city wide infrastructure can and will fail. 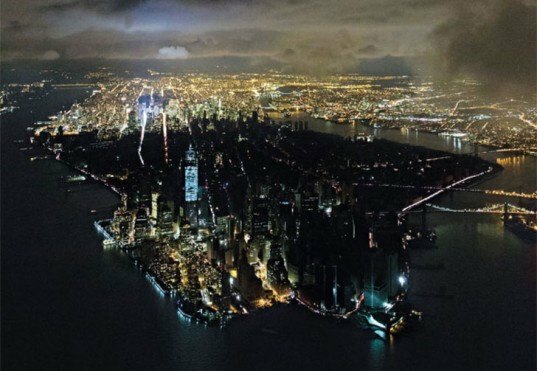 Power outages and blackouts are such a common occurrence that commercial building designers always need to design backup systems to keep a building usable and comfortable when the electricity fails – as it will occasionally! Some lessons learned from Hurricane Sandy: always have a back-up power supply, and keep your back-up power on a higher floor (not in the basement), maintain off-grid heating and cooling capabilities, make sure that building insulation is as tight as can be, make sure that natural ventilation is possible when air conditioning fails (specifically by having operable windows), and maximize daylight so that people can continue to see, work and move around without artificial light. Now that we’ve scared you with our focused look at natural disasters, let’s get back to the facts of day-to-day life. On average, a commercial building has a lifespan of 73 years (Source: 2010 Buildings Energy Data Book, US DOE), meaning over almost a century, many commercial structures will see millions of human feet trudging through its spaces. Truly resilient buildings need to not just withstand natural disasters, but they need to last through years of constant, unremitting use. So how do you make a building last longer? Designers need to build in day-to-day durability with tight building envelopes and long-lasting, low-maintenance interior finishes. First and foremost, commercial building needs to be built to last, and external building stressors start at the building envelope. A resilient, durable building employs proper sealing and insulation, especially at windows, doors and roofs, including the use of highly insulated windows (double or triple pane, often with a low-E seal and/or inert gas between panes), as well as adequate moisture protection, including flashing, drainage and moisture barriers. Not all disasters are natural. Sometimes there is human error or mechanical failure. Another concept which is important to consider when it comes to the building envelope is explosion venting. Explosion venting is often used in industrial and power generation facilities where there can be a rapid pressure release or explosion (power plants, manufacturing operations, grain mills). These types of buildings need field-testable, resettable pressure relief vents that activate at very low pressures (5psf) to protect the structural integrity of the building. Explosion vents help release pressure, helping buildings to survive the natural and manmade disasters involving explosions and excess internal pressure. Doors and entrance points need to be made especially durable, as they are the most highly-trafficked parts of a commercial building, and the most common points of failure. Think about your local bank or workplace, and how many people walk through the entrance on a daily basis, doors whipping open and closed hundreds of times in an hour, thousands of dirty (sometimes wet) feet trudging throughout the building yearly. Doors and entrance flooring take a lot of abuse, so if you want a durable building, it is imperative to have robust entrance doors and flooring be to withstand a high level of traffic. Durable entrance floor systems help buildings stand the test of time by effectively stopping dirt, water and foreign contaminants from entering a building’s interior. Specialty flooring that use tread rails, grids or robust carpeting have the ability to collect large amounts of dirt and moisture. Dirt and particulates damage floor finishes throughout the entire building, so stopping it at the door helps extend the life of all the floor finishes and reduce cleaning and replacement costs. Another way to build resilience into a building is with interior doors that will endure years upon years of use. Most commercial interiors use standard wood doors. Occasionally, high pressure laminate doors are used for greater longevity, but for true durability an architect needs to really invest in doors with a long-lasting product that is built resistant to tearing, chips and cracks. The most resilient doors are those that employ a “kit of parts” approach so that when damage does occur, only the damaged piece needs to be replaced and not the entire door. Interior walls take almost as much abuse as floors, but in the case of walls, the culprits are more often wheeled objects than feet. While thousands of scuffling feet may sound bad, walls have a unique challenge in withstanding thousands of bumps and scrapes with moving objects (eg. food carriers, carts, luggage). If building longevity is a goal, protecting interior walls is especially important, and one way this can be done is with interior wall guards such as handrails, crash rails and corner guards. As we’ve explored in this article, resilient design is a complex and many-faceted paradigm that involves long-term thinking about worst-case disaster scenarios, as well as more common, everyday wear. Though the variables which contribute to resilience are many, and often complicated – the larger lesson is simple: buildings need to be resilient in order to be truly sustainable. Photovoltaics and low-flow toilets are not enough for ‘sustainability’ – a building needs to be able to stand the test of time. As architect Carl Elefante once said, “The greenest building is the one that’s already built,” so our goal should be, as architects, to design buildings that last longer than we do. Construction Specialties manufactures and sells specialty architectural products internationally, with over 30 offices and manufacturing facilities worldwide. Its products include interior wall and door protection, entrance flooring, expansion joint covers, louvers, grilles, sun controls, explosion vents, smoke vents, and cubicle track/curtains. The company serves architects and designers, building owners, facility managers and contractors. Construction Specialties, Inc. was founded in 1948 and is headquartered in Lebanon, New Jersey. We shouldn't overlook the role of information systems for connecting the different people and data which the design or adaptation is based on. Very rarely does one person or one design office or one isolated database hold enough knowledge to achieve resilient design. Correct? Why are we still building in coastal regions instead of high-tailing it to the interior? In many Sci-Fiction writers dream of under-water cities and the Dutch created walls that hold back the seas instead of retreating inland; when there is no inland to retreat into. Maybe the cities and suburbs should adapt to the new reality, and we should not put our tails between our legs running to "higher" ground. Remember what Chicken Little said, "the sky is falling". Can you imagine New York, Miami, DC, Seattle and San Francisco ghosts cities? What about the Caribbean and other islands around the globe, where will all these people go? How do you protect a single building when you can't protect the community that it resides in? It is like you are protecting a single tree instead of the forest. 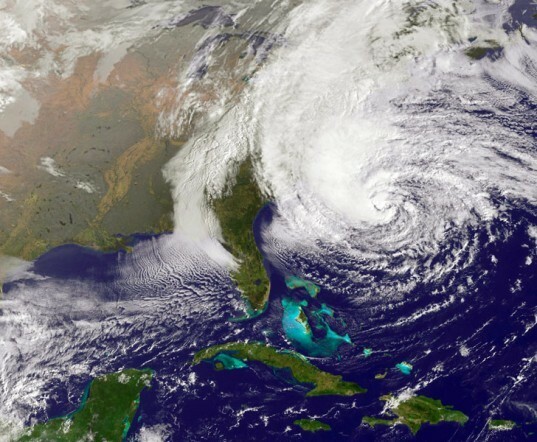 Super Storm Sandy has taught us a lesson, but what is that lesson. Many proposals that have come forth seem kind of pie in the sky, and has not a thing to do with reality. Many of the building that has suffered from Sandy are still intact and subject to the ravages of yet another super storm that will batter the East Coast causing untold damage and destruction. Every winter communities suffer from power outage due to ice, sleet, blizzards and hail, and ever year the utility crews go out and repair the damage and bring people services that they are cut off from. The powers that be claim that it is too expensive to bury the power under ground; but how much do we pay in repairing the damage? Penny wise and pound foolish. Instead of resilient building design; how about resilient community and city design? You can't make a single building hurricane proof if you don't make a community hurricane proof. 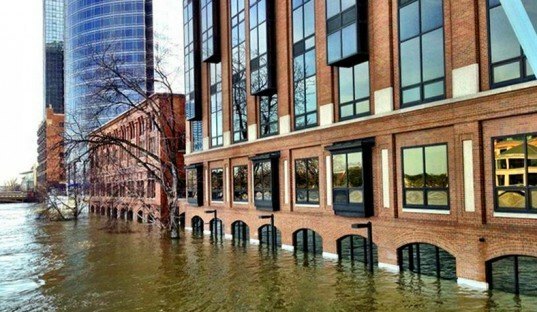 Starting in January, the Sustainable Design Institute at the Boston Architectural College is offering an eight-week, online course in Resilient Design taught by Alex Wilson, Director of the Resilient Design Institute. Resilience is definitely a trait that should be considered in all future construction, particularly in today's post-climate-change world. As the superstorms of the past few years have shown, resiliency is a critical component of sustainable building design. Also important when you consider the incredible financial costs that come with natural and other disasters. Imagine the billions that could have been saved, particularly in NY and NJ, if we had built to be resilient rather than cost effective. This is really interesting, and I think also very important. I think it's essential to think of all potential scenarios that could affect certain construction. At the same time, when do we get to the point where we say no more? For example, why are we still building in coastal areas that we are almost certain will be gone in the next few years or decades? And how do we get big developers to be more responsible? 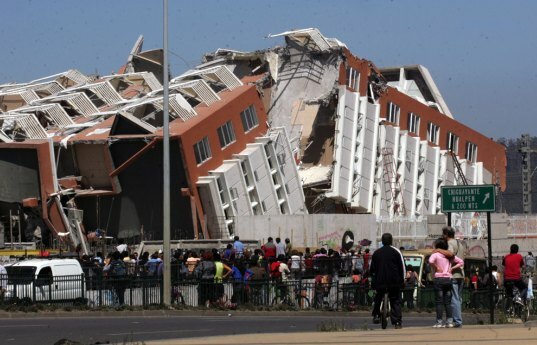 I don't think a building can be considered "sustainable" any longer unless it is also resilient.